Solomon known as a wise king is credited with the quoted Proverb. It is an obvious saying about iron. If you have a set of knives you sharpen them on another hard surface, using other iron tools. Like iron sharpening iron, one person sharpens another. If we are left on our own we are challenged to better ourselves, to push ourselves to growth. If we want to grow and become a richer, better person we should work with another person we trust toward a path of improvement. We can use job coaches to help us become better in our jobs. A job coach can listen to how we are doing and can speak to others we work with and find advice that will help us become better in our job. We can use mentors to help us in our field of excellence. A mentor is someone whose field of excellence is similar and who can share their experience in situations we need advice. We can engage a Spiritual Director to guide us on our spiritual journey. A Spiritual Director can listen to us and advise us on spiritual matters and help us deepen our prayer life. Having a friend that we work with or play with that has a similar life story and direction can be the best way to stay on track and grow. The person sharpens person model is patterned by Jesus as he sends out disciples two by two to share His message and teach communities the message of Love God, Love others and make disciples. Sometimes the best person to sharpen us is a spouse. Marriage partner’s should want each other’s best and should lovingly challenge each other. Spouses can hold each other accountable, ensuring that lives are lived in the light of God. Be someone who challenges others and welcome the challenge of others in your life. 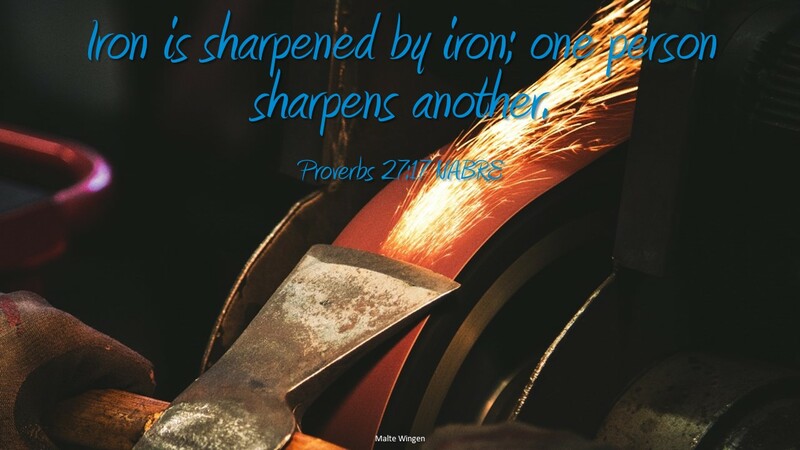 Do you have a friend who sharpens you? Do you sharpen another?